Community Shabbat Service and Dinner hosted by RCOS | Jewish Federation of Reading Pa., Inc. 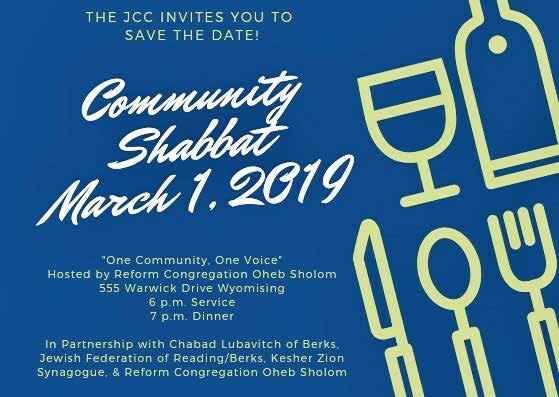 This year our community Shabbat theme is one community, one voice and will be hosted by Reform Congregation Oheb Sholom at 555 Warwick Dr. Wyomissing. First we will have a service led by Rabbi Michelson with participation from Rabbi Lipsker and other members of our community. Afterwards a Kosher meal will be served family style and a vegetarian option is available. The cost is $20 per person. Children 18 and under are free. All are welcome and if you need financial assistance to attend, please contact Sari Incledon at 610-921-0624. RSVP with payment is required by February 21 to info@jfreading.org or 610-921-0624.